For a whole suite of examples using NCL to plot WRF-ARW data, we recommend that you visit the WRF-ARW Online Tutorial. wrf_debug_1.ncl: This example shows how to draw three different lat/lon grids on a WRF output file: XLAT/XLONG, XLATU/XLONGU, and XLATV/XLONGV. If you tried to draw all three sets of lat/lon lines on a full WRF map, the plot may be very busy, so this example also shows how to zoom in on a smaller area using wrf_user_ll_to_xy to get the index locations of a smaller corner defined by the soutwest and northeast corners. 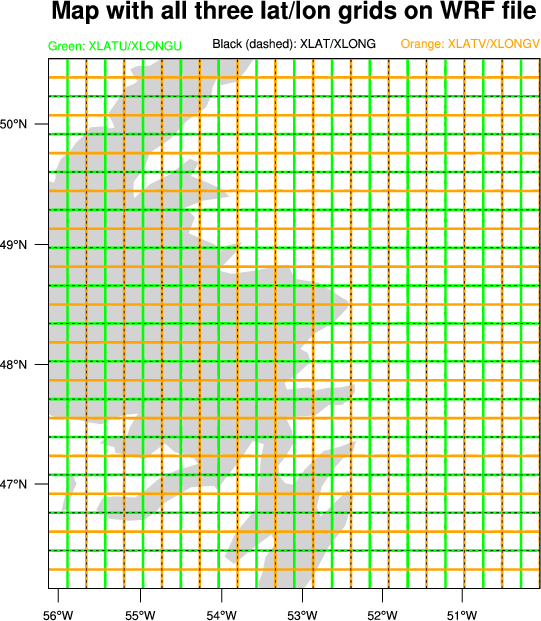 wrf_debug_2.ncl: This example shows a particular grid point on a WRF XLAT/XLONG grid and its four corners. It shows the same locations for the XLATU/XLONGU and XLATV/XLONGV grids. 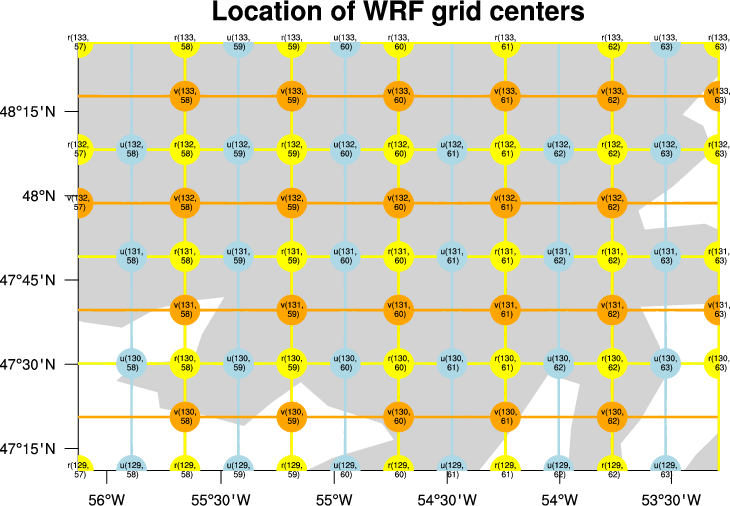 The purpose of this example is to help you understand how the various WRF grids are arranged. 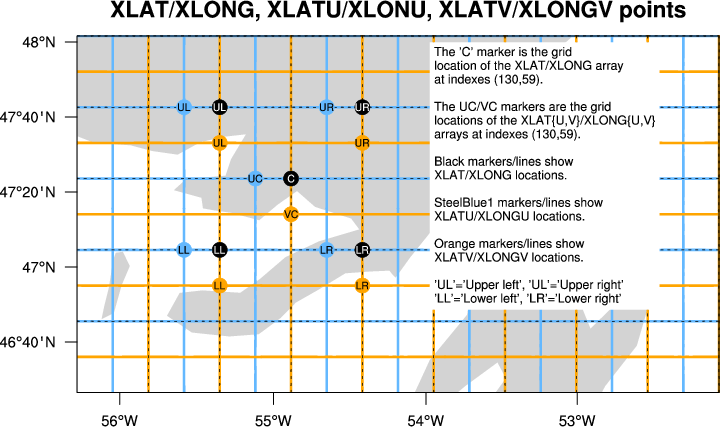 wrf_debug_3.ncl: This example draws the grid locations of XLAT/XLONG, XLATU/XLONGU, and XLATV/XLONGV using markers and text indicating the index values. wrf_debug_4.ncl: This example shows the difference between using the where function and the wrf_user_ll_to_xy function to subset a lat/lon grid. 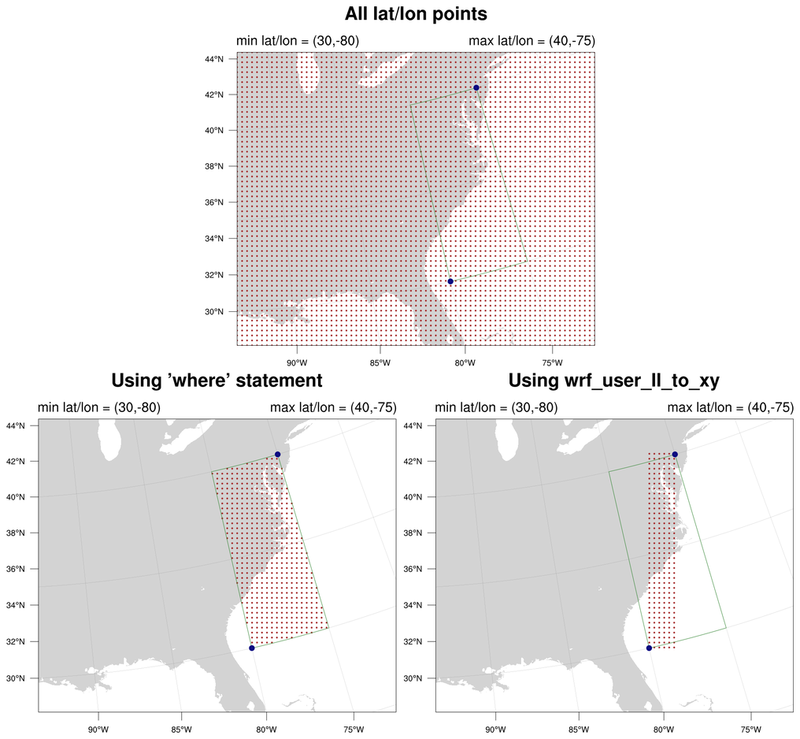 See wrf_gsn_10.ncl for an example of using these two methods plus a third method to subset data and then take a spatial average of the subsetted area.